Since 2015, when the last peace deal, Minsk II, was agreed between the ultra-nationalist junta in Kiev and the people’s republics of Donetsk and Lugansk, co-signed by France, Germany and Russia, the junta has paid ever scanter lipservice to the agreement whilst in practice doing everything possible to avoid implementing key aspects of the treaty. The ceasefire terms requiring the withdrawal of heavy artillery is breached every day by the Ukraine military and its neo-nazi auxiliaries in a low level but deadly war of attrition punctuated by spikes in violence such as those in the last weeks of 2017. At the heart of Minsk II are the provisions granting .special status., or partial sovereignty, to the Donbas republics. Kiev has previously for form’s sake gone through the motions of creating the legislative framework required in order to prepare for a negotiated form of autonomy for the Donbas. However in reality, for a long time now Kiev has treated this issue as a dead letter, while repeating its allegiance to Minsk as an empty mantra to cover its inaction. Then on 18 January a new Act was passed by the Kiev parliament, the Verkhovna Rada, which drives a coach and horses through Minsk II. This law, pompously entitled "On the peculiarities of the state policy to ensure the state sovereignty of Ukraine in the temporarily occupied territories in Donetsk and Lugansk regions", turns its back on Minsk II, treating the people’s republics, which arose in self-defence when the Donbas came under fascist attack from the Kiev junta, as if they were the invention of Russia. Subsequent attempts by the opposition in the Rada to abolish the new law have been voted down (‘Rada refuses to abolish Donbas law,’ Interfax Ukraine, 6 February 2018). Whilst France and Germany continue to voice support for the Minsk process, the US has been increasingly dismissive, and it is probable that Kiev feels it has received a green light both to tear up the agreement and to increase the provocation on Russia’s border. This supposition would appear to be borne out by new evidence that the US is increasing the flow of hi-tech weaponry to the junta. Moscow’s envoy to the OSCE (Organisation for Security and Cooperation in Europe), Alexander Lukashevich, reported that the US is supplying the Poroshenko regime with portable grenade launchers and reconnaissance drones as well as TOW anti-tank weaponry. Lukashevich noted that, since the new year, “the American Global Hawk drone has been spotted at least three times in certain areas of the Donetsk and Lugansk regions of Ukraine”. The junta is also in receipt of the Model M107A1 sniper systems. By flooding Ukraine with such weaponry (described by Washington in December as “enhanced defensive capabilities”), the US is clearly encouraging the junta to turn its back on the international agreements to which it is a signatory, thereby opening the door to highly dangerous and unpredictable consequences (‘US fosters civil war by arming Ukrainian radicals with heavy weapons’, RT, 19 January 2018). The Maidan coup of 2014 which propelled the ultra-nationalist junta into power was led by neo-nazi groups who drew their inspiration from the nazi-collaborating ‘national hero’ Stepan Bandera. Try as it may to be seen to be embracing supposed ‘European values’, the junta is never allowed to forget the fatal debt of gratitude it owes to the stormtroopers that attended its birth. The nazi Azov Battalion was rapidly incorporated into the official National Guard. 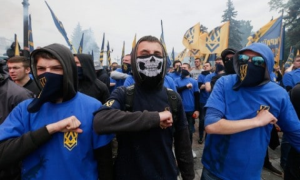 So noxious is the Azov outfit that even the US Congress felt it politic to outlaw a proposal that would have seen US instructors training and arming Azov, which Congress members correctly identified as “openly neo-nazi” and “fascist”. (The recent spotting of an Azov thug waving one of the new TOW anti-tank missile around makes it clear this pious congressional ban is more honoured in the breach than the observance). When all the fascist bluster of Azov is rebuffed by the resistance forces of the Donbas, it finds an outlet picking on some softer targets closer to home. Six hundred members of the ‘National Brigades’, drawn from the ranks of Azov, strutted through Kiev in January in a torchlit parade, vowing to use force to impose ‘Ukrainian order’, “cleansing our streets of the rot like alcoholics and drug addicts”. Their Facebook page displays videos of knife and firearm training. Police walked beside this open fascist procession without a qualm (‘Hundreds of far-right vigilantes sworn in to “enforce Ukrainian order” on Kiev’s streets’, RT, 31 January 2018). A similar level of tacit state support for fascist violence occurred on 7 February when a gang of about eight fascist hoodlums from the ‘National Squads’ assaulted two leaders of the anti-fascist committee of Ukraine, beating and robbing them and kicking them in the face. For good measure the nazis videoed their own attack. This violent assault happened just 20 metres from a police checkpoint, in clear view of the law, but police did not intervene. When the police eventually turned up, it was to take the victims to the police station, and the latest information was that the police had yet to press charges against the assailants (‘Ukraine: Condemn attack on anti-fascist activists in Kiev’, Red Star over Donbas, 11 February 2018). Meanwhile, as the junta slips back into the fascist gutter whence it came and wades deeper in blood in its failing war of oppression against the Donbas, the masses of Ukraine find themselves cruelly deceived as the promised land of European Association turns out not to be all it was cracked up to be. Last November the country’s economy minister confessed that, since leaving the free trade zone with Russia and entering the free trade zone with Europe, the economy lost almost a fifth of its GDP. Before the Maidan coup GDP stood at $183bn; currently that figure stands at $93bn. The average Ukrainian monthly income stands at $220, leaving citizens with the worst living standards in Europe according to one survey (‘Ukraine is Europe’s poorest nation with $220 average monthly wage’, RT, 11 December 2017).